We woke up late because we forgot to set our alarm clock. And another reason why we didn’t wake up early was because we didn’t pay for breakfast meal at the hotel (for the entire stay in the hotel). 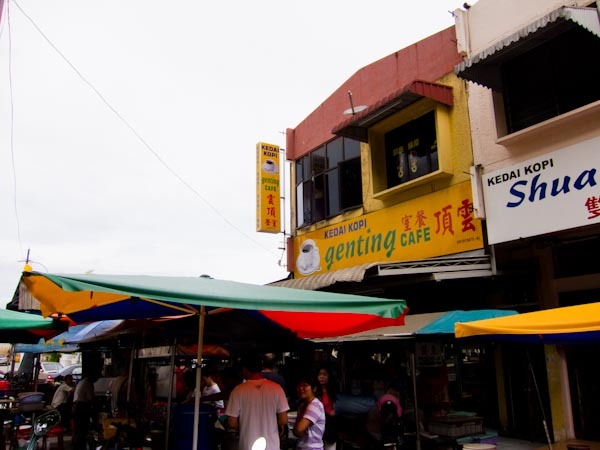 We found that there’s no reason to do so since there’re abundance of delicious food available in Penang at any time of the day. And hence, we slept till late morning. We left the hotel at about 1130AM to begin our day. There was no plan whatsoever and there was nothing we wanted to do. And hence, we considered it as free and easy day. Besides, it was gloomy day and that pretty much made us lazy. We drove out in search of this place for our breakfast. 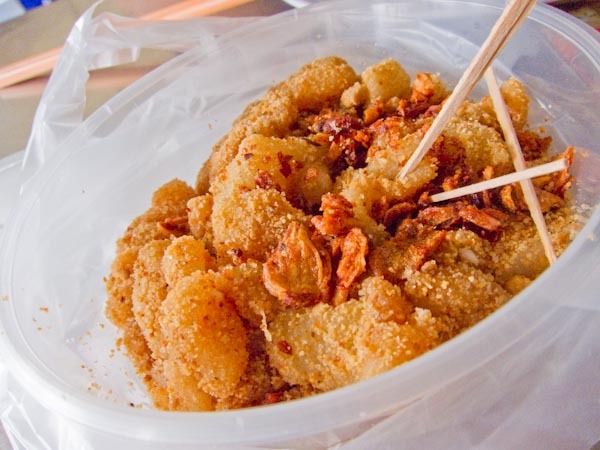 It is a corner lot shop with lots of stalls in it selling a variety of hawker food. It is approximately 20 minutes drive from George Town to get to this place as it is located around housing area. 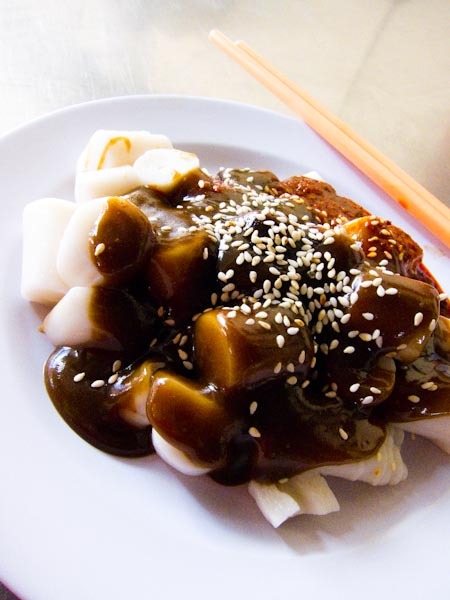 And the reason why we took the trouble to travel out far was because of this; chee cheong fun. It was really good. Silky smooth yet springy texture of rice rolls complemented really well with their brown sauce. 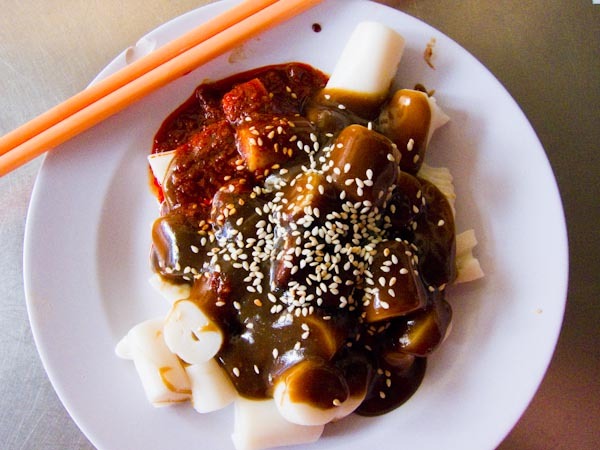 Best of all, it’s not just any generic brown sauce you normally get from your chee cheong fun stall. It’s their special brown sauce which was not overly sweet yet it left a slight salty aftertaste. 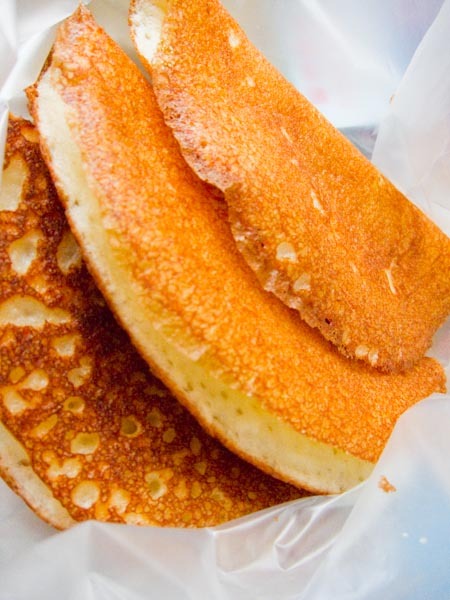 We couldn’t stop eating it as it was addictive (in a good way). The chilli sauce beside it wasn’t spicy but it was sufficient to give a kick. A small plate would cost RM 2.70. Apart from that, my friend ordered a plate of Hokkien Char. Up till now, it beats me why my friend did so. It wasn’t good at all. Although there were plenty of ingredients in it, it was just edible at best. There was no required wok hei in it. And it costs us RM 3.30 for this dish. It was forgettable and far cry from what we have in Klang Valley. We should have gone for Hokkien Mee instead. There were small stalls outside of the coffee shop too. That was where my friend bought some snacks like kuih bakul (RM 2.20 for 3 pieces), mua chi (RM 1.50), and apoms (RM 2.00). 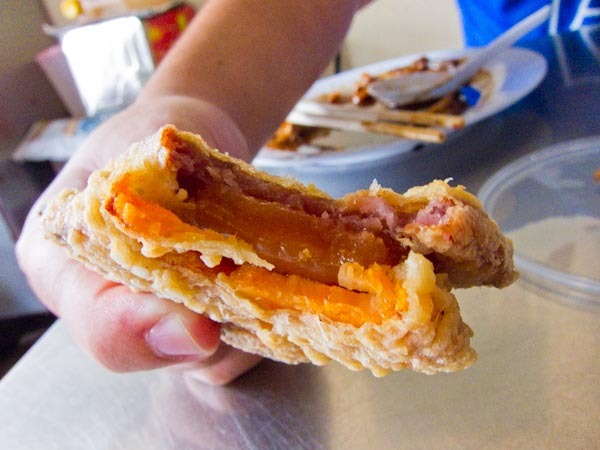 For the uninitiated, kuih bakul is essentially a type of dessert consists of yam and sweet potato sandwiched with sweet sticky nin ko. The ones we had that day were alright. The batter was thin and crisp while the thickness of the yam and sweet potato were thinner compared to the thickness of the nin ko. 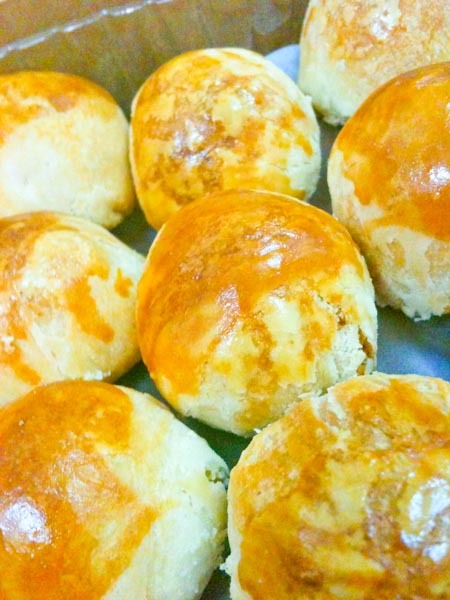 There’s nothing to shout about for the soft fluffy apoms although I prefer it to be filled with more fillings in it. The sight of fried shallots on top of the crushed peanut was rather unusual (for me at least) but somehow, it bonded pretty well with the mua chi which was soft yet chewy. It was yet another addictive stuff. While leaving the coffee shop, we were asking each other what’s the next thing. Questions were thrown around with places to visit were put to the table for consideration. We were either not interested or too far to travel to. And that was when we decided to visit another food joint for our lunch. Did I mention we are gluttons? 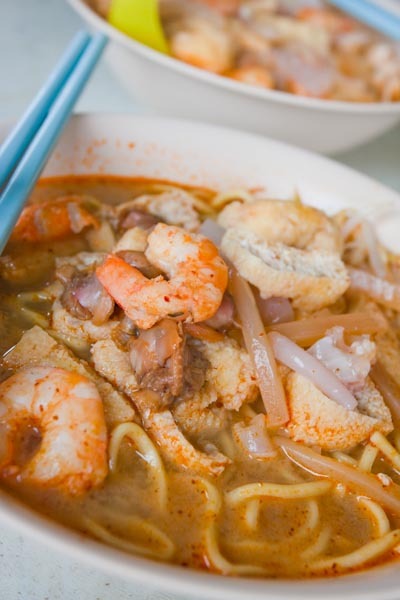 That brought us to a place whereby a stall serves its famed Lorong Seratus Tahun curry mee. The location as mentioned is along Lorong Seratus Tahun (next to McAllister Road) where there is a corner lot coffee shop. The parking was yet another challenging part as there were not many lots around it. It was close to lunch time but there weren’t many customers when we arrived. We were able to get our orders within 5 minutes of waiting time. There was another stall in the same coffee shop selling chicken rice but we didn’t manage to try it. Topped with decent amount of prawns, squids, cockles and tau pok (beancurd), the broth wasn’t thick as there was little coconut milk in it. Besides, if it’s by any indication of the colour, it wasn’t spicy at all. 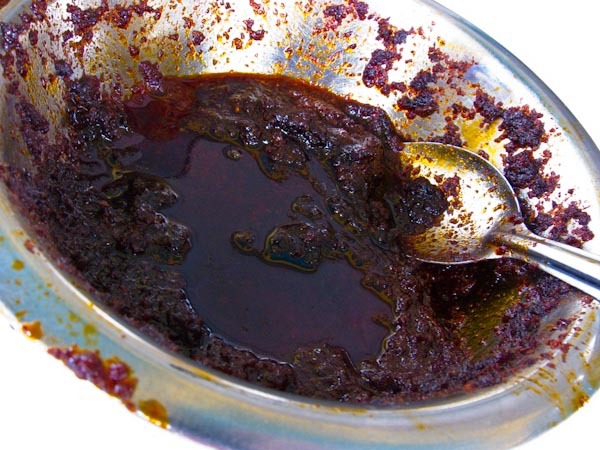 That’s because we were given the option to control the level of spiciness we could handle by adding chilli paste (photo above) into our individual bowl. It may look darkish red but it wasn’t spicy as you would think it is. Overall, the curry mee was alright. Maybe I’m used to thicker spicier broth. Somehow, this one was lack of punch / flavour as I would like it to be. A small portion would set you back RM3.50. Really stuffed after the meal, we were really tempted to just head back to the hotel and sleep. 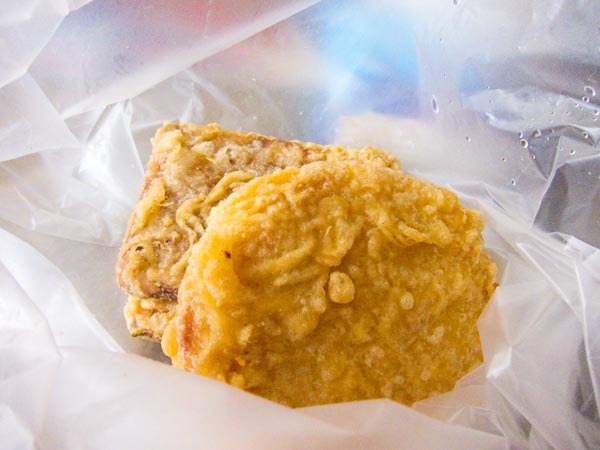 But that’s was just a thought as we remembered that we needed to get some tau sar peah from Him Heang. After all, it was Saturday and they are not open for business on Sunday. Hence, we had to get it on that day itself. We arrived there about 130PM and there were streams of crowd (mostly tourists) lining up to buy something. Unfortunately, we were told that they were out of stock and we had to go back at about 230PM if we are still interested. Not wanting to wait there for 1 hour, off we went to George Town for some dessert at Kek Seng Coffee Shop. 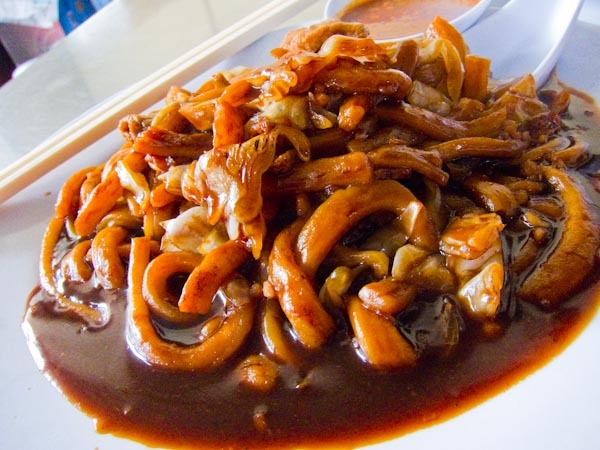 Located along Penang Road, Kek Seng is well known amongst the locals and tourists for its vast variety of hawker food such as char koay teow, lobak, rice and etc. When we arrived at the scene, we weren’t surprised by the sheer amount of crowd in the coffee shop dining while the rest were waiting for empty tables. After all, it was lunch time and hence, explains the crowd. Although there are two shop lots, the space is limited with wooden tables and chairs are placed close to each other. 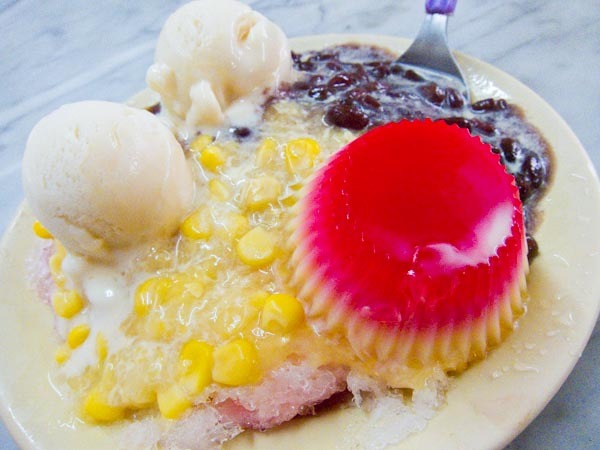 Apart from the food, Kek Seng is also known for their homemade durian ice cream. Smooth and fragrant, the two scoops of durian ice cream were good that it put those ready-made ones to shame. What’s more is that it came with generous amount of toppings such as sweet corns, red beans and jelly. A plate like this will set you back about RM3.50. It is prefect dessert for a hot weather. Do insist of durian ice cream when you order ice kacang or else you will probably be given other type of ice cream flavours. We went back to Burma Road again to get our stuff done. This time, the crowd grew bigger and we had to wait for another 45 minutes before we could get our stuff. The traffic was crazy / clogged up as tourists tend to park their cars irresponsibly beside the road making the 3-lane road to become 1 lane only. After all that’s done, we wanted to drive to Batu Ferringhi to visit the beach. But sadly, on halfway through, we were caught in a bad jam. Unknowingly, there was a carnival going on at Batu Ferringhi. And hence, we made a U turn and headed back to our hotel. We wanted to stop by at Toy Museum but didn’t do so as the parking was very limited. The following hours were rather torturing as I was having mild diarrhoea. Not sure which was the culprit, but I suspect it was the curry mee – more specifically, the oily chilli paste. I could be wrong though but all I can is that it wasn’t fun to visit the toilet every 15 minutes or so. Not a single bit but the toilet bowl and I were good friends by the end of the day. Heh!